RAPAR has been involved since Stand Up To Racism began in 2012. 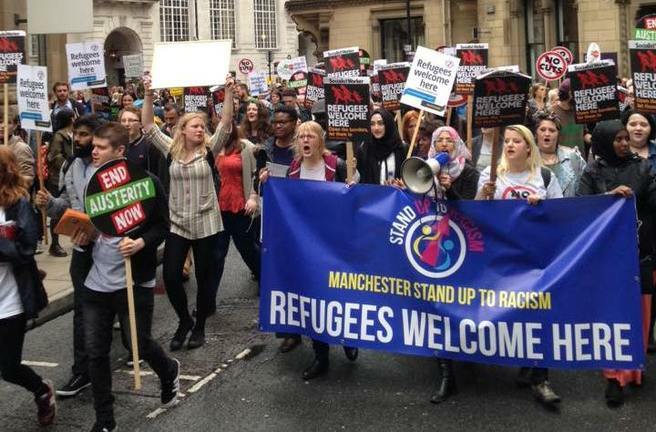 21st March is United Nations Anti-Racist Day and, on the nearest Saturday to this day every year, there is a national Anti-Racist demonstration in London that RAPAR always sends a delegation to. This year (2015), because of the ways in which refugee people are being demonised and criminalised, coupled with the most severe refugee crisis since World War Two, RAPAR has been developing work to both support the people in Calais and do everything we can so that they can become safe in the UK. 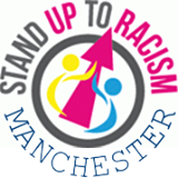 We have been doing this in collaboration with Stand Up To Racism nationally and, on September 12th 2015, we were part of launching Greater Manchester's Stand Up To Racism group. See RAPAR's launch statement here. "This racist tide will only be driven back by you and me standing up and confronting it. From Germany to Greece to Ferguson, people who want a society free from racism are saying no more. People are taking to the streets in large numbers to oppose the racist Pegida movement in Germany and the Neo-Nazi Golden Dawn in Greece, and to protest institutional racism and police violence against Black communities. People are outraged at the Islamophobic and anti-Semitic backlash after the Copenhagen and Paris attacks, and the mass media silence on the Chapel Hill shootings where three Muslim students were brutally shot dead, so many have mobilised under the slogan ‘Muslim Lives Matter’. Immigrant communities are fed up with being wrongly blamed for an economic crisis they did not create. On UN anti-racism day people across the world will be taking a stand. Will you be there? We are the majority and we will stand up to racism." 5000 plus people who have fled into Europe and who are camped in Calais, including families with children, becomes more and more acute (French court orders government to implement improvements). Our contributions towards ensuring that they can become safe, avoid death and reach their destination "the UK" where they have actual connections of one from or another, which is why they are camped out in Calais in the first place) - has to include highlighting their conditions (see Doctors of the World report here) and calling upon our own government to enable their entry. This situation is even more pressing “ and complex“ since the events in Paris. RAPAR's One for One Bike Project (see below), will be taking a van load of bikes to Calais on the 13th December so that people can get into Calais town as they need to from the camp which is two miles away. We are also organising a delegation that represents people in the North-West of England who say that the people there must not freeze. Download a collection sheet here. The Gaskell Bike Project, is a collaboration between the Gaskell Garden Project and RAPAR. During the bonfire on the 5th of November, bikes, bike parts, helmets, etc. were collected. Therefore then, for any two bikes one goes to Calais and one stays in Manchester. These bikes are being provided for refugees in both these places as being able to move around is vital to do one's everyday businesses. Yesterday, to the strains of Reggae artist, Natty, a terrible beauty was born. “The Jungle”, Calais, France is an open sewer on industrial wasteland. It is the name of the refugee camp where a reported 5000 plus people, including around 1000 women and some children, are living. It was a truly international gathering. Theresa May's speech made last week during the Tory party conference laid out a number of home office policy positions relating to immigration and asylum in the UK. The speech (found here) makes a number of claims regarding the economic effect of immigration and asylum in the UK whilst also laying out new plans for border controls and crackdowns.